...now, what about the third? Former Major League catcher Joe Torre will be managing the Dodgers next season. Another former catcher, Joe Girardi, will be at the managerial helm of the Yankees. So, now there's the matter of where Jorge Posada will play next season. Rumors continue to swirl about whether or not Posada will still be a Yankee in 2008. The Mets are actively pursuing him, and one writer seems to think the Mets are hoping that Posada doesn't want to play for Joe Girardi; they're hoping that rumors about a rift between the two are true. Those who believe Posada will stay with the Yankees keep bringing up the fact that he and Derek Jeter are best friends. Posada would never want to be without his best friend, they say, making it sound as if the catcher would die if Jeter wasn't his teammate anymore. Come on. He's a grown man. He and Jeter are buddies, not lovers. I don't think his world would end if he and Derek Jeter weren't teammates anymore. 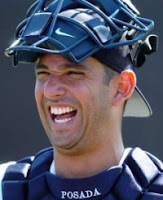 Anyway, as long as the Mets are in play Yankee fans won't have to worry about Posada leaving the Bronx. The Yankees will give him an outrageous contract to avoid seeing him chase pop-ups in foul territory out in Flushing.